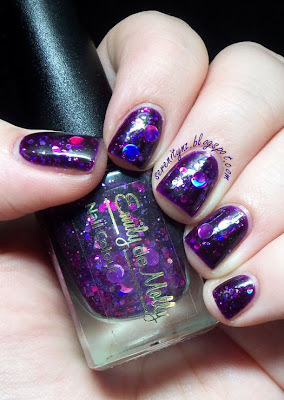 Ahhh, love it :P A definite must-have for any circle glitter lovers! 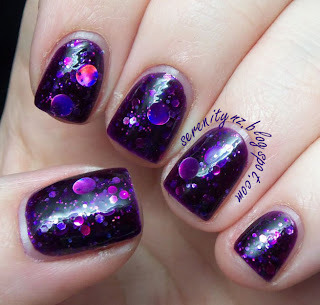 The pics show 3 coats of Cosmic Forces with 1 coat of top coat. Formula is good, however you do have to fish a bit for the larger glitters. Cosmic Forces is a dark purple jelly polish, filled with Lavender holo dots and hex and pink dots glitter. The holographic circles in the jelly base give the polish really good depth - definitely one of those polishes that you put on and then spend the rest of the day staring at your hands. Emily de Molly has followed this up with a blue version (Oceanic Forces) and a black version (Dark Forces). These polishes are available to Australians through Emily de Molly's etsy store, or Femme Fatale Cosmetics. Internationals can stalk Mei Mei's Signatures and Llarowe for restocks.